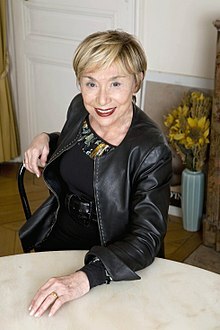 Julia Kristeva (French: [kʁisteva]; Bulgarian: Юлия Кръстева; born 24 June 1941) is a Bulgarian-French philosopher, literary critic, semiotician, psychoanalyst, feminist, and, most recently, novelist, who has lived in France since the mid-1960s. She is now a professor emeritus at the University Paris Diderot. The author of more than 30 books, including Powers of Horror, Tales of Love, Black Sun: Depression and Melancholia, Proust and the Sense of Time, and the trilogy Female Genius, she has been awarded Commander of the Legion of Honor, Commander of the Order of Merit, the Holberg International Memorial Prize, the Hannah Arendt Prize, and the Vision 97 Foundation Prize, awarded by the Havel Foundation. Kristeva became influential in international critical analysis, cultural studies and feminism after publishing her first book, Semeiotikè, in 1969. Her sizeable body of work includes books and essays which address intertextuality, the semiotic, and abjection, in the fields of linguistics, literary theory and criticism, psychoanalysis, biography and autobiography, political and cultural analysis, art and art history. She is prominent in structuralist and poststructuralist thought. Kristeva is also the founder of the Simone de Beauvoir Prize committee. 2.1 The "semiotic" and the "symbolic"
Born in Sliven, Bulgaria to Christian parents, Kristeva is the daughter of a church accountant. Kristeva and her sister attended a Francophone school run by Dominican nuns. Kristeva became acquainted with the work of Mikhail Bakhtin at this time in Bulgaria. Kristeva went on to study at the University of Sofia, and while a postgraduate there obtained a research fellowship that enabled her to move to France in December 1965, when she was 24. She continued her education at several French universities, studying under Lucien Goldmann and Roland Barthes, among other scholars. On August 2, 1967, Kristeva married the novelist Philippe Sollers, né Philippe Joyaux. Kristeva taught at Columbia University in the early 1970s, and remains a Visiting Professor. She has also published under the married name Julia Joyaux. After joining the 'Tel Quel group' founded by Sollers, Kristeva focused on the politics of language and became an active member of the group. She trained in psychoanalysis, and earned her degree in 1979. In some ways, her work can be seen as trying to adapt a psychoanalytic approach to the poststructuralist criticism. For example, her view of the subject, and its construction, shares similarities with Sigmund Freud and Lacan. However, Kristeva rejects any understanding of the subject in a structuralist sense; instead, she favors a subject always "in process" or "on trial". In this way, she contributes to the poststructuralist critique of essentialized structures, whilst preserving the teachings of psychoanalysis. She travelled to China in the 1970s and later wrote About Chinese Women (1977). The "semiotic" and the "symbolic"
One of Kristeva's most important contributions is that signification is composed of two elements, the symbolic and the semiotic, the latter being distinct from the discipline of semiotics founded by Ferdinand de Saussure. As explained by Augustine Perumalil, Kristeva's "semiotic is closely related to the infantile pre-Oedipal referred to in the works of Freud, Otto Rank, Melanie Klein, British Object Relation psychoanalysis, and Lacan's pre-mirror stage. It is an emotional field, tied to the instincts, which dwells in the fissures and prosody of language rather than in the denotative meanings of words." Furthermore, according to Birgit Schippers, the semiotic is a realm associated with the musical, the poetic, the rhythmic, and that which lacks structure and meaning. It is closely tied to the "feminine", and represents the undifferentiated state of the pre-Mirror Stage infant. Upon entering the Mirror Stage, the child learns to distinguish between self and other, and enters the realm of shared cultural meaning, known as the symbolic. In Desire in Language (1980), Kristeva describes the symbolic as the space in which the development of language allows the child to become a "speaking subject," and to develop a sense of identity separate from the mother. This process of separation is known as abjection, whereby the child must reject and move away from the mother in order to enter into the world of language, culture, meaning, and the social. This realm of language is called the symbolic and is contrasted with the semiotic in that it is associated with the masculine, the law, and structure. Kristeva departs from Lacan in the idea that even after entering the symbolic, the subject continues to oscillate between the semiotic and the symbolic. Therefore, rather than arriving at a fixed identity, the subject is permanently "in process". Because female children continue to identify to some degree with the mother figure, they are especially likely to retain a close connection to the semiotic. This continued identification with the mother may result in what Kristeva refers to in Black Sun (1989) as melancholia (depression), given that female children simultaneously reject and identify with the mother figure. It has also been suggested (e.g., Creed, 1993) that the degradation of women and women's bodies in popular culture (and particularly, for example, in slasher films) emerges because of the threat to identity that the mother's body poses: it is a reminder of time spent in the undifferentiated state of the semiotic, where one has no concept of self or identity. After abjecting the mother, subjects retain an unconscious fascination with the semiotic, desiring to reunite with the mother, while at the same time fearing the loss of identity that accompanies it. Slasher films thus provide a way for audience members to safely reenact the process of abjection by vicariously expelling and destroying the mother figure. Kristeva is also known for her adoption of Plato’s idea of the chora, meaning "a nourishing maternal space" (Schippers, 2011). Kristeva’s idea of the chora has been interpreted in several ways: as a reference to the uterus, as a metaphor for the relationship between the mother and child, and as the temporal period preceding the Mirror Stage. In her essay Motherhood According to Giovanni Bellini from Desire in Language (1980), Kristeva refers to the chora as a "non-expressive totality formed by drives and their stases in a motility that is full of movement as it is regulated." She goes on to suggest that it is the mother's body that mediates between the chora and the symbolic realm: the mother has access to culture and meaning, yet also forms a totalizing bond with the child. Kristeva is also noted for her work on the concept of intertextuality. Kristeva argues that anthropology and psychology, or the connection between the social and the subject, do not represent each other, but rather follow the same logic: the survival of the group and the subject. Furthermore, in her analysis of Oedipus, she claims that the speaking subject cannot exist on his/her own, but that he/she "stands on the fragile threshold as if stranded on account of an impossible demarcation" (Powers of Horror, p. 85). Kristeva has been regarded as a key proponent of French feminism together with Simone de Beauvoir, Hélène Cixous, and Luce Irigaray. Kristeva has had a remarkable influence on feminism and feminist literary studies in the US and the UK, as well as on readings into contemporary art although her relation to feminist circles and movements in France has been quite controversial. Kristeva made a famous disambiguation of three types of feminism in "Women's Time" in New Maladies of the Soul (1993); while rejecting the first two types, including that of Beauvoir, her stands are sometimes considered rejecting feminism altogether. Kristeva proposed the idea of multiple sexual identities against the joined code[clarification needed] of "unified feminine language". Kristeva argues her writings have been misunderstood by American feminist academics. In Kristeva's view, it was not enough simply to dissect the structure of language in order to find its hidden meaning. Language should also be viewed through the prisms of history and of individual psychic and sexual experiences. This post-structuralist approach enabled specific social groups to trace the source of their oppression to the very language they used. However, Kristeva believes that it is harmful to posit collective identity above individual identity, and that this political assertion of sexual, ethnic, and religious identities is ultimately totalitarian. Kristeva wrote a number of novels that resemble detective stories. While the books maintain narrative suspense and develop a stylized surface, her readers also encounter ideas intrinsic to her theoretical projects. Her characters reveal themselves mainly through psychological devices, making her type of fiction mostly resemble the later work of Dostoevsky. Her fictional oeuvre, which includes The Old Man and the Wolves, Murder in Byzantium, and Possessions, while often allegorical, also approaches the autobiographical in some passages, especially with one of the protagonists of Possessions, Stephanie Delacour—a French journalist—who can be seen as Kristeva's alter ego. Murder in Byzantium deals with themes from orthodox Christianity and politics; she referred to it as "a kind of anti-Da Vinci Code". For her "innovative explorations of questions on the intersection of language, culture and literature", Kristeva was awarded the Holberg International Memorial Prize in 2004. She won the 2006 Hannah Arendt Prize for Political Thought. She has also been awarded Commander of the Legion of Honor, Commander of the Order of Merit, and the Vaclav Havel Prize. Roman Jakobson said that "Both readers and listeners, whether agreeing or in stubborn disagreement with Julia Kristeva, feel indeed attracted to her contagious voice and to her genuine gift of questioning generally adopted 'axioms,' and her contrary gift of releasing various 'damned questions' from their traditional question marks." Roland Barthes comments that "Julia Kristeva changes the place of things: she always destroys the last prejudice, the one you thought you could be reassured by, could be take [sic] pride in; what she displaces is the already-said, the déja-dit, i.e., the instance of the signified, i.e., stupidity; what she subverts is authority -the authority of monologic science, of filiation." Ian Almond criticizes Kristeva's ethnocentrism. He cites Gayatri Spivak's conclusion that Kristeva's book About Chinese Women "belongs to that very eighteenth century [that] Kristeva scorns" after pinpointing "the brief, expansive, often completely ungrounded way in which she writes about two thousand years of a culture she is unfamiliar with". Almond notes the absence of sophistication in Kristeva's remarks concerning the Muslim world and the dismissive terminology she uses to describe its culture and believers. He criticizes Kristeva's opposition which juxtaposes "Islamic societies" against "democracies where life is still fairly pleasant" by pointing out that Kristeva displays no awareness of the complex and nuanced debate ongoing among women theorists in the Muslim world, and that she does not refer to anything other than the Rushdie fatwa in dismissing the entire Muslim faith as "reactionary and persecutory". In Intellectual Impostures (1997), physics professors Alan Sokal and Jean Bricmont devote a chapter to Kristeva's use of mathematics in her writings. They argue that Kristeva fails to show the relevance of the mathematical concepts she discusses to linguistics and the other fields she studies, and that no such relevance exists. In 2018, Bulgaria’s state Dossier Commission announced that Kristeva had been an agent for the Committee for State Security under the code name "Sabina". She was supposedly recruited in June 1971. Five years earlier she left Bulgaria to study in France. Under the Communist regime, any Bulgarian who wanted to travel abroad had to apply for an exit visa and get an approval from the Ministry of Interior. The process was long and difficult because anyone who made it to the west could declare political asylum. Kristeva has called the allegations "grotesque and false". On 30 March, the state Dossier Commission began publishing online the entire set of documents reflecting Kristeva's activity as an informant of the former Committee for State Security. She vigorously denies the charges. Neal Ascherson wrote: "...the recent fuss about Julia Kristeva boils down to nothing much, although it has suited some to inflate it into a fearful scandal... But the reality shown in her files is trivial. After settling in Paris in 1965, she was cornered by Bulgarian spooks who pointed out to her that she still had a vulnerable family in the home country. So she agreed to regular meetings over many years, in the course of which she seems to have told her handlers nothing more than gossip about Aragon, Bataille & Co. from the Left Bank cafés – stuff they could have read in Le Canard enchaîné... the combined intelligence value of its product and her reports was almost zero. The Bulgarian security men seem to have known they were being played. But never mind: they could impress their boss by showing him a real international celeb on their books..."
Strangers to Ourselves. New York: Columbia University Press,1991. Marriage as a Fine Art (with Philippe Sollers). New York: Columbia University Press, 2016. Irene Ivantcheva-Merjanska, Ecrire dans la langue de l'autre. Assia Djebar et Julia Kristeva. Paris: L'Harmattan, 2015. David Crownfield, Body/Text in Julia Kristeva: Religion, Women, and Psychoanalysis, State University of New York Press, 1992. Teresa, My Love: An Imagined Life of the Saint of Avila. New York: Columbia University Press, 2015. ^ Kelly Ives, Cixous, Irigaray, Kristeva: The Jouissance of French Feminism, Crescent Moon Publishing, 2016. ^ Creech, James, "Julia Kristeva's Bataille: reading as triumph," Diacritics, 5(1), Spring 1975, pp. 62-68. ^ Nilo Kauppi, Radicalism in French Culture: A Sociology of French Theory in the 1960s, Burlington, VT, 2010, p. 25. ^ Schrift, Alan D. (2006). Twentieth-century French Philosophy: Key Themes and Thinkers. Blackwell Publishing. p. 147. ISBN 1-4051-3217-5. ^ Benoît Peeters, Derrida: A Biography, Cambridge: Polity Press, 2013, pp. 176-77. ^ Riding, Alan, Correcting Her Idea of Politically Correct. New York Times. 14 June 2001. ^ Hélène Volat, Julia Kristeva: A Bibliography (bibliography page for Le Langage, cet inconnu (1969), published under the name Julia Joyaux). ^ McAfee, Noêlle (2004). Julia Kristeva. London: Routledge. p. 38. ISBN 0-203-63434-9. ^ "State University of New York at Stony Brook". Archived from the original on 2004-11-20. Retrieved 2004-11-23. ^ Perumalil, Augustine. The History of Women in Philosophy. ^ Schippers, Birgit (2011). Julia Kristeva and Feminist Thought. ^ Griselda Pollock, Inscriptions in the feminine. In: Inside the Visible edited by Catherine de Zegher. MIT Press, 1996. ^ Parallax, n. 8, [Vol. 4(3)], 1998. ^ Griselda Pollock, Encounters in the Virtual Feminist Museum. Routledge, 2007. ^ Sutherland, John (14 March 2006). "The ideas interview: Julia Kristeva; Why is a great critic ashamed of being fashionable?". The Guardian. Retrieved 23 November 2014. ^ ″Bulgaria’s Dossier Commission posts Julia Kristeva files online″, The Sofia Globe, 30 March 2018. Retrieved 30 March 2018..
^ ″Unprecedented - The Dossier Commission Published the Dossier of Julia Kristeva AKA Agent "Sabina", novinite.com, 30 March 2018. Retrieved 30 March 2018. ^ Documents on the Dossier Commission’s website (in Bulgarian). Retrieved 30 March 2018. ^ Христо Христов, ″Онлайн: Първите документи за Юлия Кръстева в Държавна сигурност″, desebg.com, 29 March 2018 (Dossier of ″Sabina″, in Bulgarian). Retrieved 31 March 2018. ^ Христо Христов, ″Само на desebg.com: Цялото досие на Юлия Кръстева онлайн (лич��о и работно дело)″, desebg.com, 30 March 2018 (Dossier of ″Sabina″, in Bulgarian). Retrieved 31 March 2018. ^ Jennifer Schuessler and Boryana Dzhambazova, ″Bulgaria Says French Thinker Was a Secret Agent. She Calls It a ‘Barefaced Lie.’″, ″The New York Times″, 1 April 2018. Retrieved 2 April 2018. ^ Schuessler, Jennifer; Dzhambazova, Boryana (2018-04-01). "Bulgaria Says French Thinker Was a Secret Agent. She Calls It a 'Barefaced Lie.'". The New York Times. ISSN 0362-4331. Retrieved 2018-04-02. ^ Neal Ascherson, "Don’t imagine you’re smarter", London Review of Books, 19 July 2018. Goodnow, Katherine J.(2015). Kristeva in Focus: From Theory to Film Analysis Berghahn Books.